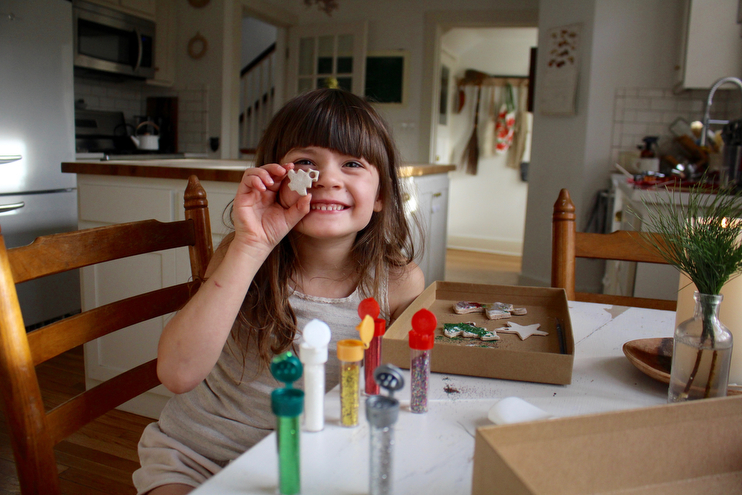 We made cinnamon salt dough ornaments as a winter craft this season and Stella liberally decorated them with dollar store glitter. I am still finding it all over the house from that one hour we made this craft, and every time I see a shimmery speck glistening in between the cracks of the floorboards I cannot help but smile. Also, I cannot get over how big she looks here. Maybe it’s the bangs. Maybe it’s that grown up grin and how she smiles with her amaretto colored eyes. She’s getting so big and it’s all moving so damn fast. Reading has never felt more important in my life than it does right now. I can’t seem to get enough of it these days and have found myself in bed early most nights soaking up the pages others have poured their hearts and souls onto. Give me all the memoirs! I haven’t done a library post in awhile in this space, but should have one coming up soon. I am currently reading Ann Lamott’s book called Traveling Mercies. I cannot recommend it enough and cannot wait to fold back the first pages of Bird By Bird here in a few days. 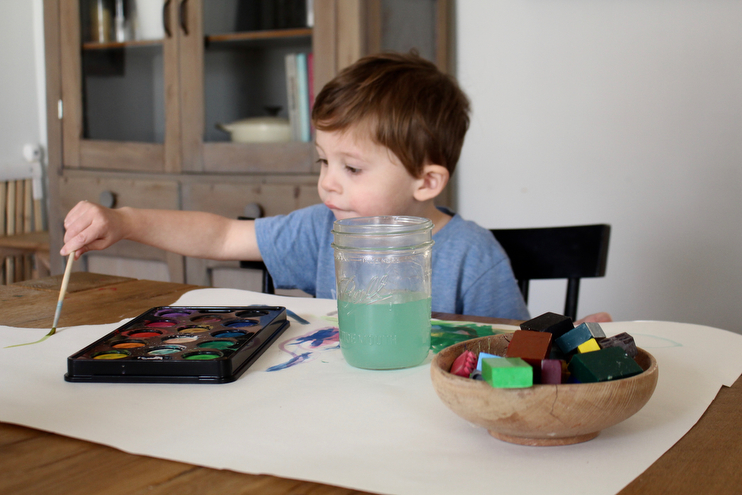 Theodore’s favorite craft right now is painting. I adore how concentrated he becomes when creating something to hang on our old plaster walls. He also got some wonderful square beeswax crayons for Christmas from nana and papa and those have been a hit, too. I have been going through all my cookbooks this winter, looking up new recipes to try to pull me out of the meal planning rut I seem to fall into each season. I put my favorites in an old fruit basket I thrifted on the counter of our pantry, and every evening at about four thirty they shine. I’ve also just noticed a major red theme happening here. Interesting! A few days ago I came down the stairs with my arms full of dirty towels and saw the boys on top of our rickety kitchen table having an afternoon snack. The Waldorf window stars we made the week before made rainbows on the backs of their fuzzy heads and it was really beautiful seeing them sit there sharing something sugary. I am convinced that there may be nothing sweeter than seeing my babies get along and truly want to be with one another. Winter light is so beautiful, isn’t it? I noticed our dresser was illuminated the other day and it made me smile. On it I have a small picture of my mom and I from a hot summer week spent in Ortonville, Minnesota years ago. My great grandma lived on the lake there and this is the two of us walking along the rocky shell-crushed shores just outside her house. I have always treasured this photo but now that I have a little girl of my own it’s even more special to me. My mom also gave me that little Jizo statue. It is a protector of travelers, women, and children. I treasure it. I have a sweet little calendar hanging on our fridge and every time I see the words “January” I let out a sigh of relief that a new year has arrived and 2016 is long gone. Last year was heavy. I am ready for a new start. 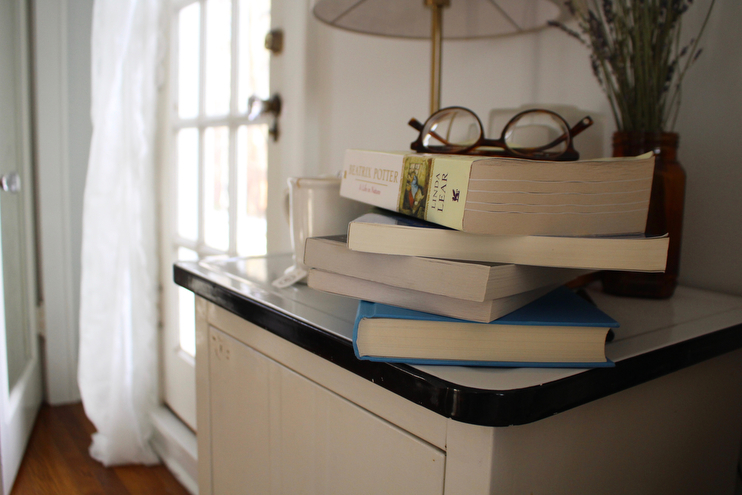 Winter means more messes inside than out and our living room usually looks like this. Before bed we’ll all chip in and tuck things back into baskets before heading upstairs to brush our teeth, and them in again the morning the ritual dumping of toys commences as we kick off yet another wintery day. So I gave Alfie a horrible first haircut in the kitchen the other morning, my knees bent on the hard floor and him squirming on my lap like a worm out of mud. After one clip of the sheers he ran off up the stairs, so part two of his first haircut took place in the bathroom with his pudgy feet halfway out the door and me pleading with him to sit still. In all, I ended up giving him an uneven and very feminine bob similar to one I requested my hair stylist cut in college based on a very thin photograph I cut from a magazine of Victoria Beckham. Victoria’s short, angular hairstyle was “the Rachel” hairstyle for that embarrassing chunk of years, and I think I thought sporting it would make me look skinnier. It didn’t. Oh, sweet Alfie. A bad first home cut must be a right of passage, no? Maybe if he sits still tomorrow I’ll be able to fix it, probably not though. To be honest, his big ol’ cheeks are so cute you kind of look right past it. The boys and I made pinecone bird feeders at school the other day. To make them you just roll pinecones in peanut butter and then dip into bird seed. Easy! Then, tie with a string to somewhere birds love to linger and eat away. I was combing through Pinterest the other day looking for a simple, new craft to try with the kids and I came across a bunch of cotton ball activities. Talk about nostalgia. The kids made snowball snowmen on black construction paper and they turned out super sweet. This was taken the day it felt like we were living in a snow globe. It was so quiet and wonderful and for a moment I decided winter is my favorite season. One day before supper Stella treated her brothers and herself to various snacks from the cupboard and they sneaked over by the couch to eat them together, whereafter she promptly told on herself by saying, “Mom, come look how cute we look!” I had to agree. I don’t like them filling up on snacks before supper, but this I love. Though hard and exhausting and every little thing in-between, these years are magic and we need not lose sight of that. This was taken pre-bad hair cut when Alfie embraced those long curls and broke apart Theodore’s train village. This kid has one speed: get into stuff and then get into more stuff. Stella’s room has been the hub of blanket forts lately and she insists on making them herself. She’s an independent turkey and I adore that about her feisty spirit. I also love that she lines up her babies on her bed because I used to do that too. Did you know citrus removes grime and goo? I use lemons to get rid of the yucky stuff on our oven grates and it works like a charm! This is something I do once a month or so, but with all the soupy splatters I’ve been making I should probably do it more often. Here is Stella’s gingerbread house from a holiday evening we spent at church. It took her about thirty minutes to just do the pretzels on the roof and then the boys started having meltdowns so I shoved a lot of candy in the pockets of my winter coat and we finished it at home. Theodore ate half of it the next day but it was pretty while it lasted! I have been roasting the heck out of all kind of veggies this winter. If it grew in the mud, chances are I’ve tried roasting it. Right now I am all about making roasted golden beet salad with blue cheese, walnuts, red onion, and spicy dijon vinaigrette. Yum. Theodore and Alfie’s teacher gave each of them a little beeswax ornament for Christmas this year. How cute! We do a toddler program once a week with other little ones and their parents and it has blessed us so much this year. This is a lantern Stella made in school for Martinmas this year. She took a mason jar and glued different kinds of tissue paper on the inside, then glued stars to the outside. When lit, it shines all sorts of colors on our walls. Like most families in the wintertime, we had a rough week where all five of us were down for the count with some sort of illness. It was a long week you guys. And while we are all better and fever free, I still feel like I am recovering. I think because our weather keeps fluctuating it has been harder for me to jump back into things, so I am taking it easy and getting as much rest as possible. Look at those lips. He took a five hour nap this afternoon and for the last hour of it I curl up alongside him. I also love his new haircut. A professional did it, and it does not look like Victoria Beckham circa 2005, praise the Lord.